Antique natural amber bead necklace, circa 1900. The amber is considerably older. 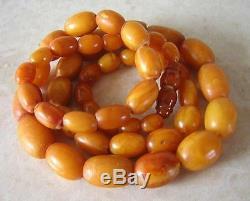 Beautiful butterscotch yellow/ orange oval beads. 100 % guaranteed natural amber. Total weight is 22.11 gms. The necklace measures 21.75 ins. The largest bead measures 12 x 11 mm. Replacement bakelite amber screw barrel clasp. Some very minor chips to a few of the beads. ANTIQUE NATURAL BALTIC YELLOW BUTTERSCOTCH OVAL AMBER BEAD NECKLACE 22 gms. Antique natural amber oval bead necklace circa 1900. Guaranteed 100% genuine natural amber. Beautiful yellow & orange butterscotch amber tones. It measures 21.75 ins. Total weight: 22.11 gms. Largest oval bead measures 12 x 11 mm. Replacement bakelite amber screw barrel fastener. Please check if intending to wear. Please let the photos show you how lovely it is. Personal Cheques from the U. To be fair to everyone, - We don't do that. We always take very great care in wrapping your items. We always obtain a certificate of posting or receipt from the post office. We will always forward you any tracking numbers. We cannot be held responsible for items once they have left me. We do not make a claim on your behalf. Small Parcels 1st Class max. PLEASE NOTE: ANY UNDER INSURED PACKAGES WILL BE AT YOUR RISK. This includes Europe/ USA /Canada / Asia / Australia & New Zealand. SMALL PACKET SIGNED FOR INTERNATIONAL. PLEASE NOTE: ANY UNDER INSURED PACKAGES WILL ENTIRELY BE AT YOUR RISK. PLEASE NOTE : ANY UNDER INSURED, PACKAGES WILL BE AT YOUR RISK. Get images that make Supersized seem small. Tailor your auctions with Auctiva's. The item "ANTIQUE NATURAL BALTIC YELLOW BUTTERSCOTCH OVAL AMBER BEAD NECKLACE 22 gms" is in sale since Friday, May 11, 2018. This item is in the category "Jewellery & Watches\Vintage & Antique Jewellery\Vintage Fine Jewellery\Victorian (1837-1901)". The seller is "ladygateley1" and is located in Norwich.